My mother sewed the jacket of this Vogue pattern for me when I was in high school. I still have the pattern and the jacket! She made it in a sewing class taught by a woman who had worked in the couture department of I. Magnin in San Francisco during the 1950s and 60s. She taught us couture techniques she had used at I. Magnin replicating garments purchased in France. Copying French Haute Couture garments was a common practice in the 1950s. The Couture houses sold the patterns or muslin toiles to the department stores that sent their buyers to Paris to view the fashion shows. The store might purchase a designer original as well as the pattern and make garments they could retail for less. My mother used most of these techniques making this jacket. The jacket still looks good on the outside! Maybe that is why the jacket still looks very good after all these years! One thing that does not look good - the lining! Lining fabrics are often made out of acetate. Acetate linings in vintage garments often change color over time - becoming a strange reddish or purple tome. This is caused by gas fading or fume fading, as result of exposure to atmospheric gases or gas heat. Acetate is a weak fiber and has poor abrasion resistance which results in the lining wearing out before the outer fabric. Since I still have the original pattern, making a new lining and setting it into the garment by hand will be an easy project! 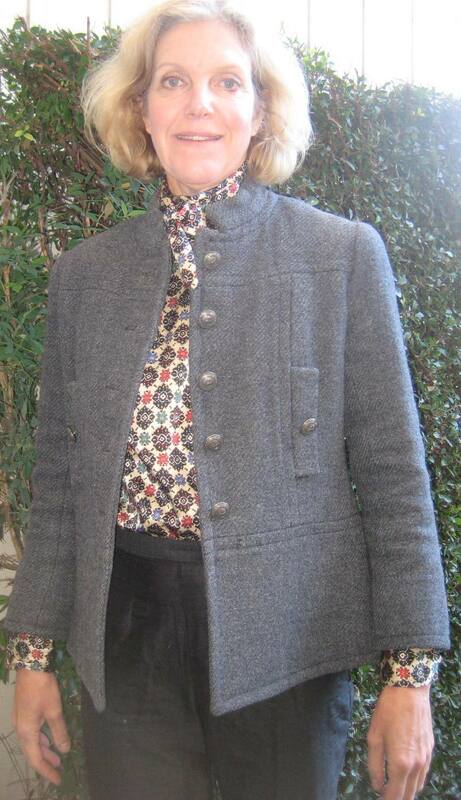 I wore it recently with a printed charmeuse stock-tie blouse that I designed in the late 1980s.